I'm looking forward to Splintered. Siege and Storm!! Or Scarlet maybe? So excited for Scarlet and Clockwork Princess! Indigo Spell by Richelle Mead, Boundless by Cynthia Hand and Clockwork Princess by Cassandra Clare! Thanks for the chance to win a wonderful giveaway! I can't wait for Reaver's story in the Lords of Deliverence series by Larrisa Ione! Lover at Last by JR Ward!! Shades of Earth is one of the 2013 releases I'm most looking forward to. :) Also, PRODIGY by Marie Lu. Probably Requiem and Sweet Peril. Thanks! Appollyon by Jennifer Armentrout! Thanks! SHADES OF EARTH and STOLEN NIGHTS are two YA's I'm most looking forward to in 2013. Thank you. Shades of Earth, Scarlet, and Splintered. With All My Soul by Rachel Vincent!! Thanks for this giveaway. Across the Universe is a series I've been wanting to read for a very long time. All three books are on my Christmas Amazon wishlist, it would be awesome to win this one! I am looking forward to goddess, the last divergent book! I am looking forward to Clockwork Princess! Unravel Me cannot get here fast enough!! Untold by Sarah Rees Brennan! There are so many awesome titles - I can't pick just one! I really want to read Ashes on the Waves by Mary Lindsey!! Dark Triumph by Robin LaFevers! OMG there are soo many! 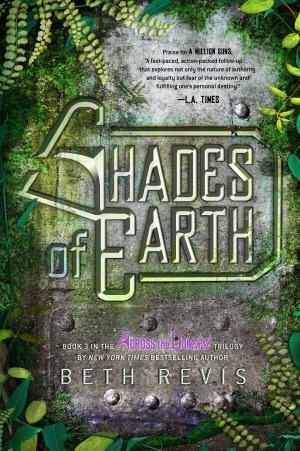 Shades of Earth is definitely one I cannot wait to read!! Shades of Earth is at the top of my list!!! !